The Second Night, 1929, oil on canvas, 48 x 40 in. From a contemporary black and white photograph; present location unknown. 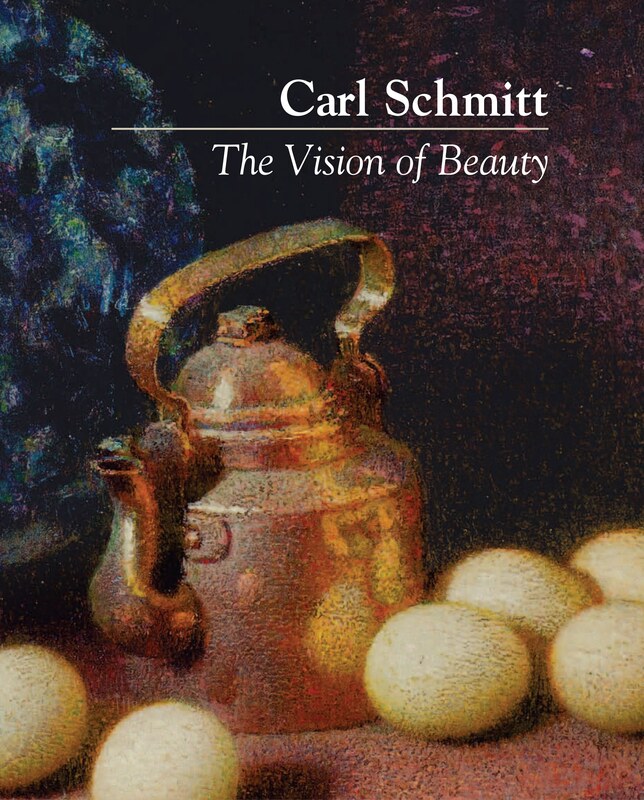 For Carl Schmitt’s own “explanation” of this painting, see the article “The Artist Explains His Work,” from February 2015 issue of the CSF e-newsletter Vision. 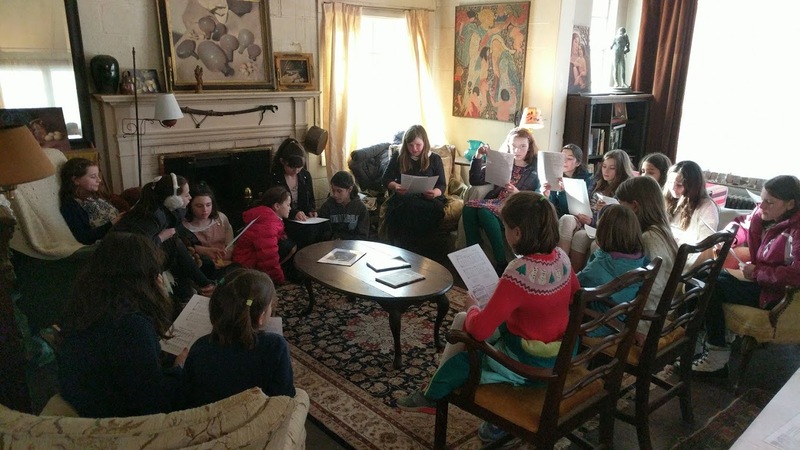 Last week a class of thirty joined CSF Artist-in-Residence Andrew de Sa at the Carl Schmitt Studios for a course entitled “Truth in Drawing: How to Draw with Your Eyes, Not with Your Head.” The group of local middle school girls also got a look at the art and sketchbooks and journals in the studios, explored Carl Schmitt’s house, and heard a bit about his life and work before crowning the afternoon with a celebration of the Feast of St. Joseph. 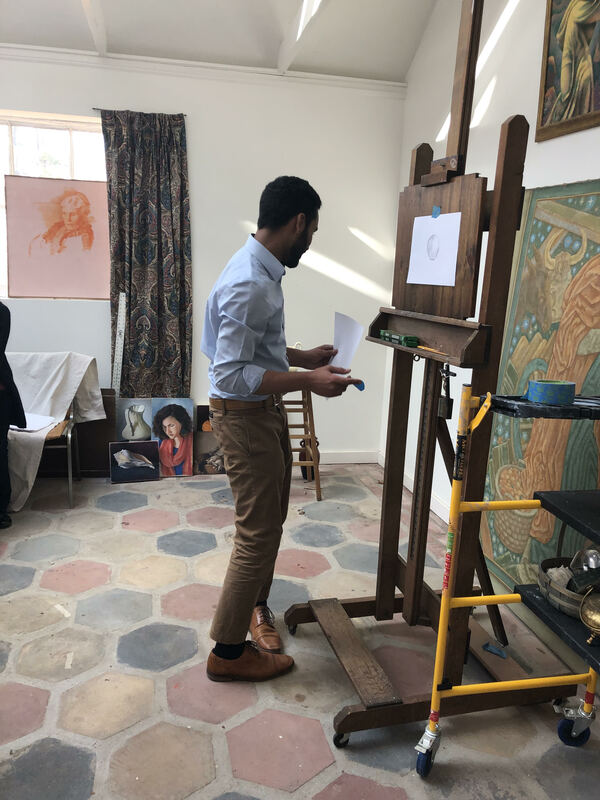 After the Opening Tour, everyone settled into the working studio and Andrew brought out his easel. Using an apple as his subject, he began with a drawing demonstration. 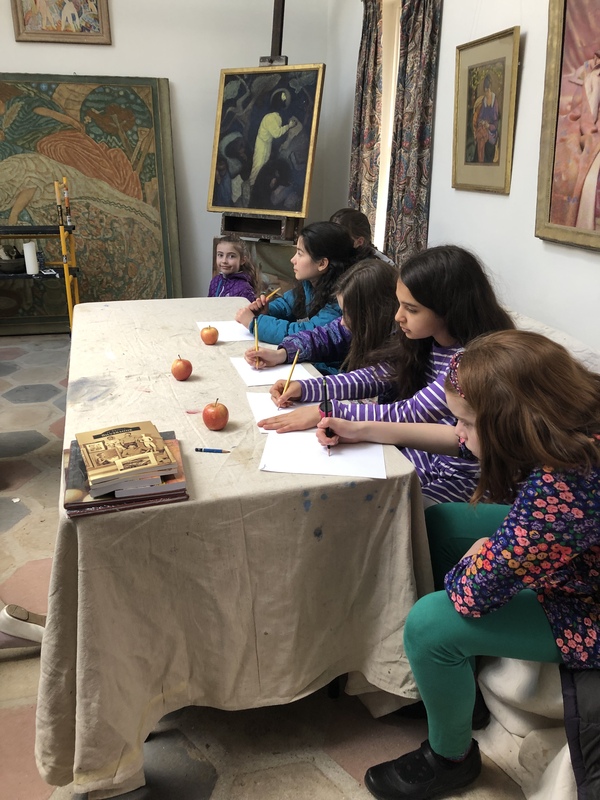 The students then set about their work, each attempting, with some coaching from Andrew, to capture the “realness,” the peculiarities, the roundness, and the light upon the apples in front of them. 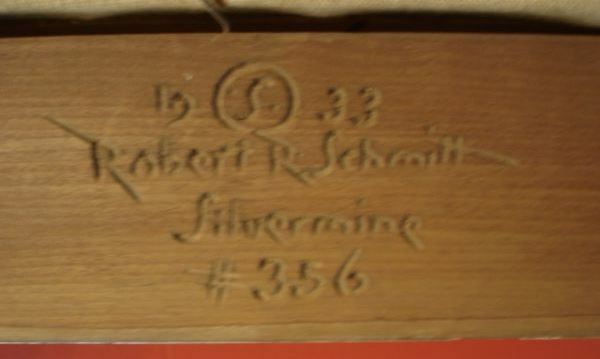 When they had put their signatures on their first drawings, the students headed to the house of Carl and Gertrude (“Mamo”) Schmitt. In Mamo’s charming flagstone-floor kitchen they piped ricotta cheese filling into their homemade St. Joseph zeppole, which they enjoyed with a cup or two of tea. 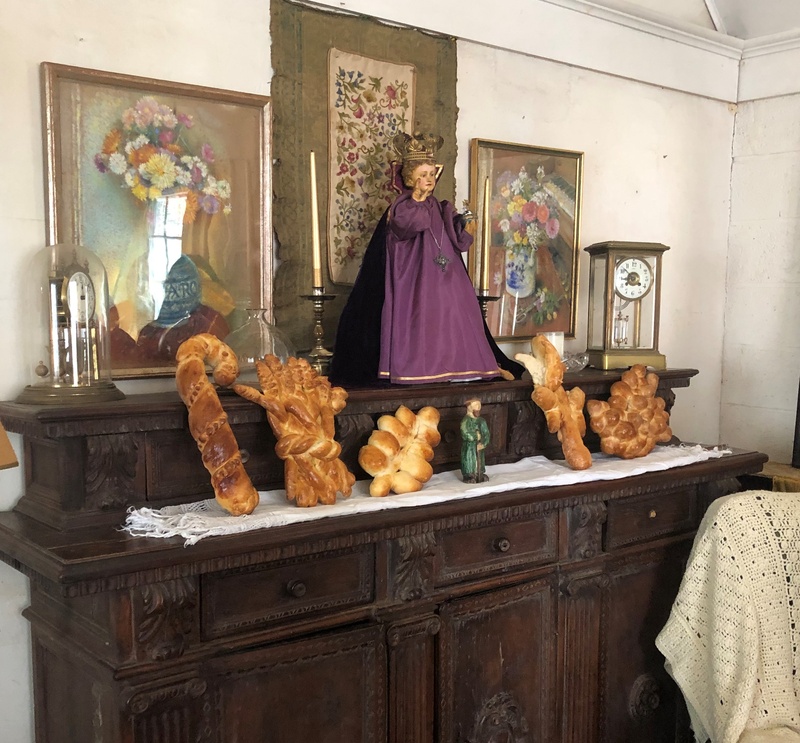 Back upstairs in Carl and Gertrude’s living room they gathered around the Schmitt family’s statue of the Infant of Prague, the same shrine where the family would pray each night for the safe return of Schmitt’s sons from war. Because it was the Feast of St. Joseph (March 19), the Infant was joined by a little St. Joseph statue from the family’s nativity set, made by the artist’s son David when he was a boy. Around the statue we placed homemade shaped breads for a little “St. Joseph Table” of our own. There, we sang songs in honor of St. Joseph and songs for the season of Lent, including the lovely Italian hymn “Glory be to Jesus“. We closed with a prayer to the Holy Infant and the Litany of St. Joseph to ask his special protection for all of our fathers. 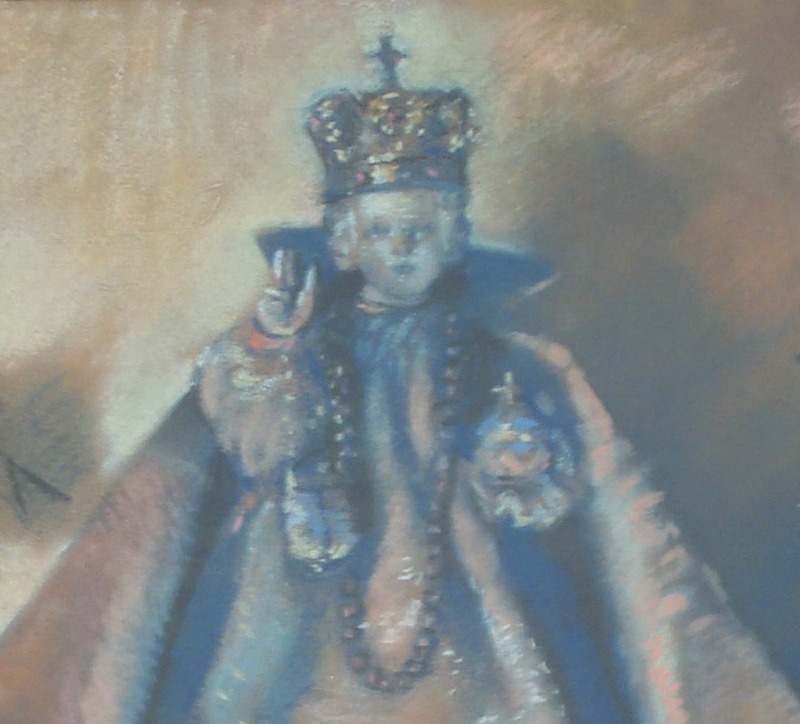 Detail of Carl Schmitt’s pastel of his family’s statue of the Infant of Prague, traditionally invoked for protection in time of war. After a supper of homemade minestrone soup and our St. Joseph bread, we gathered all of the donations that the girls brought for the needy who visit the Merton Center, a local food pantry. 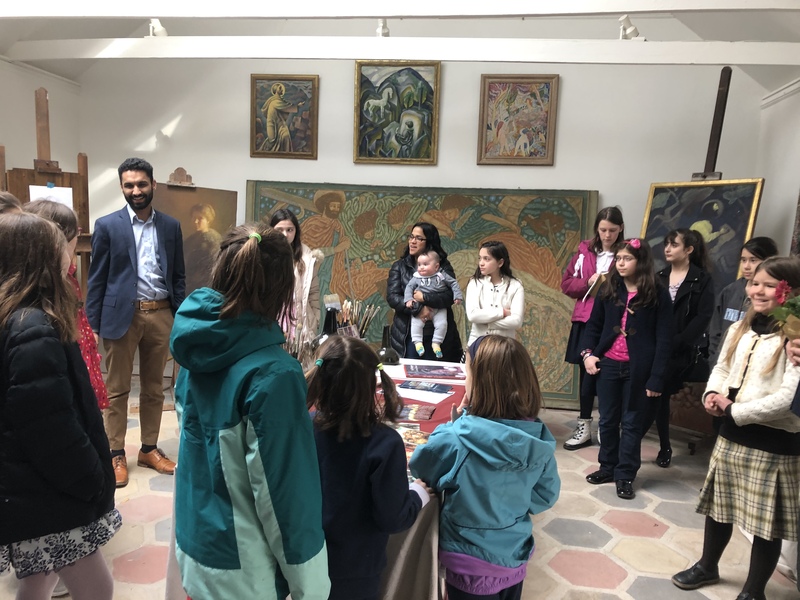 In all a wonderful afternoon with a truly remarkable, energetic, and fun group of girls and their mothers, and the first of many courses and events at the CSF Home and Studios. Muses Marooned, 1934, oil on canvas 35 x 41¾ in. Original frame by Carl’s bother Robert, 1933. 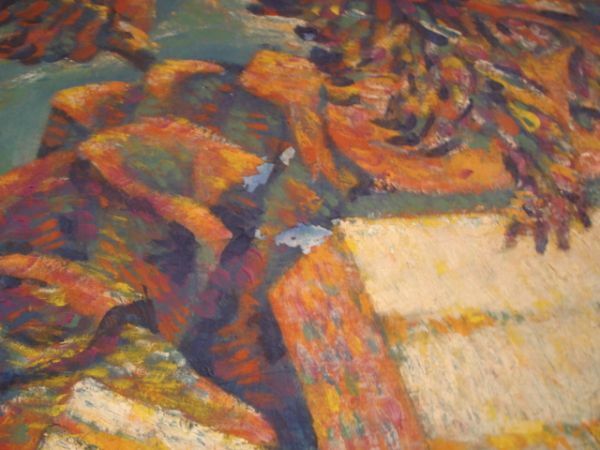 Two large paintings by Carl Schmitt are being offered at an auction this Sunday, March 10, 2019, by Clarke Auction Gallery in Larchmont, New York. Palace of Septimius Severus, oil on canvas, c. 1950, 20 x 24 in. Muses Marooned and Palace of Septimius Severus were both originally owned Carl Schmitt’s longtime friend Harold Morton Landon. Landon was a successful stockbroker in New York with a wife and two children when he met Schmitt on a journey back to America from Europe in 1927. A cultured man who translated Portuguese and Latin and boasted a fine collection of old master paintings, Landon became an avid “fan” of the younger artist. “I too have so few people in the world that I care about seeing, but few I love with an intense devotion,” he wrote Schmitt in August, 1932. “Seeing so much of you, Gertrude and Robert” – Schmitt’s wife and brother – “has made me appreciate you more each day, and has made me humble, realizing what a complete zero I am compared with any one of you. I always feel better after being with you!” Landon commissioned Schmitt to paint his fantastical St. Francis and the Unicorn around this time. From the time they first met in 1927 until the early 1960s, Landon followed Schmitt’s career closely, seeing all the exhibitions he could and even helping to arrange shows for his friend with galleries in New York. Around 1930 he had Schmitt paint a portrait of his wife Frederica, who had formed a warm friendship with Carl’s wife Gertrude. 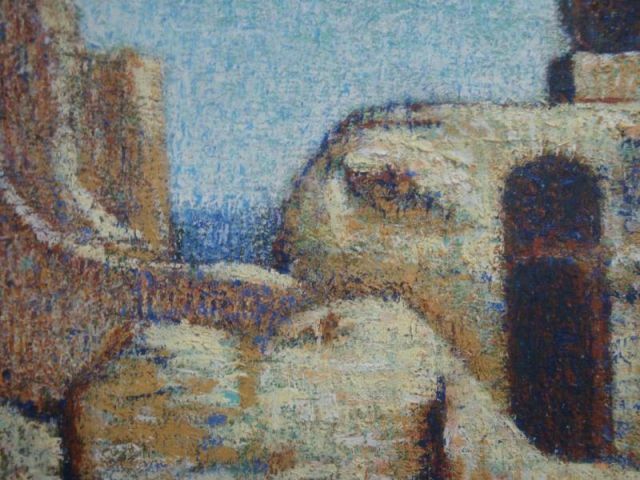 Muses Marooned was first exhibited at the 33rd Carnegie International Exhibition in autumn, 1934. It was one of the last in a series of Schmitt’s “muse” paintings which includes Muses on the Mount, Muses in the Valley and The Muses Disagree (all 1921), The Holy Spirit and the Muse (1922), and Muses Marooned (two versions, 1934 and 1936). 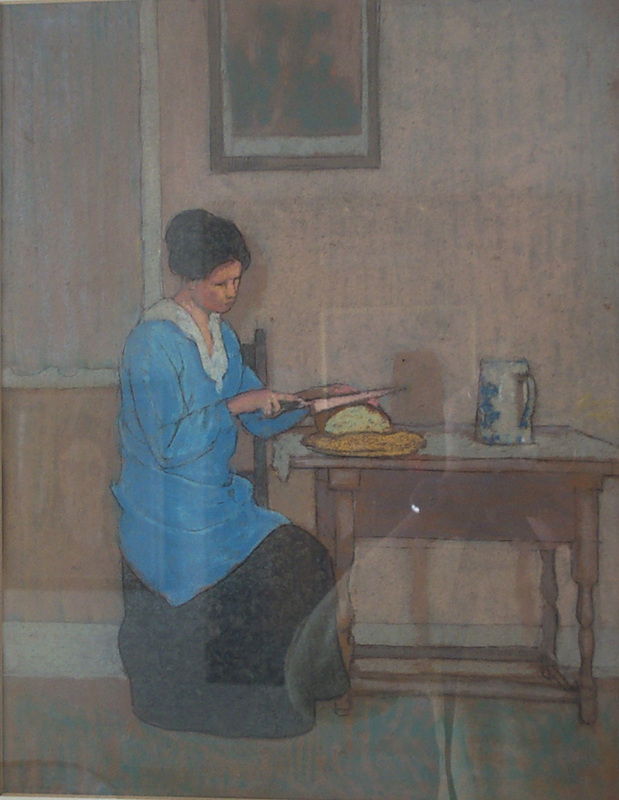 The painting is being offered with its original frame carved by Carl’s brother Robert in 1933. 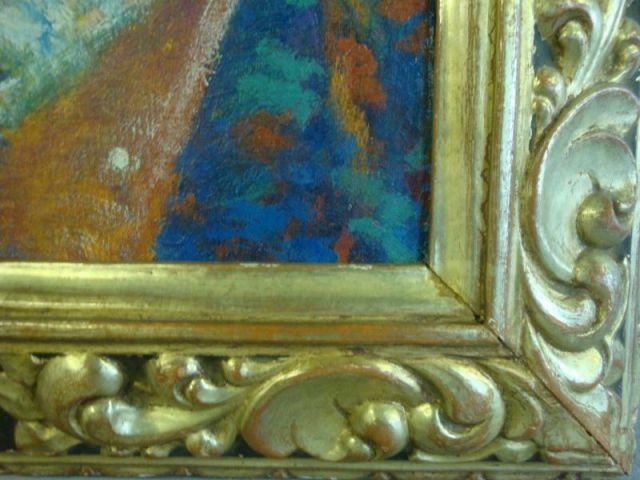 Robert Schmitt’s cartouche on the reverse of the frame of Muses Marooned. In the early 1950s, Schmitt surprised Landon with a large painting of the Palace of Septimus Severus, based on sketches Schmitt had done while in Rome in the 1930s. In honor of the gift, Landon wrote a dedicatory poem which is still attached to the back of the frame. 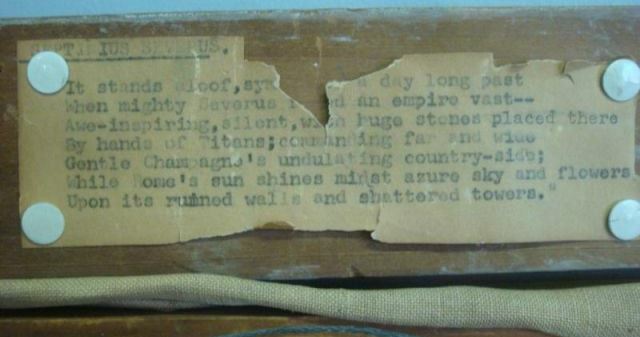 Poem in praise of the famous Roman ruin by Schmitt’s friend Harold Landon attached to the back of the frame of Palace of Septimius Severus. Carrying the Cross, etching, 1922, 7 x 13 in. “Goodness is sacrificial: based upon suffering.